Eris Morn: Not a funeral. A death ceremony. Crota's essence is being prepared for the next realm. Cayde: (skeptically) Right. (normal) So when you get to this funeral, Oryx will be watching close. Use Rasputin's cloak to slip past the Taken. Find Crota's soul, wrap it up, and get out. The Guardian finds themselves at the end of The Stills, approaching the bridge into Crota's lair. Ghost: Where exactly are we headed? Eris: When the Deathsingers begin their song, you'll know we are close. Cayde: What she's trying to say is that she doesn't know. Don't worry, I'll keep my ear to the ground. Eris: And I will try not to step on his head. The bridge now complete, the Guardian makes their way across the blinding hallway of light. Cayde: Stay out of sight. We need you back alive. You have the frequency, Ghost? Ghost: And your... modifications. We'll be ready. Eris: Then move quietly and unseen... like death. The Guardian reaches the Oversoul Throne, hidden away in a room. Ghost: Let's hope this works... cloaking. The Guardian's body disappears in a wisp of energy. At this point in the mission, the camera switches to third person view for the player. Ghost: I can't see you. Can you see me? The Guardian walks outside, completely invisible. Unfortunately, the area is swarming with Hive hierarchy. The area is entirely silent out of respect for their fallen god, save for the thudding footsteps of Knights and Ogres patrolling the area. Cayde: (speaking softly) Keep your distance. They can't see you, but they can still smell you. Eris can replace her ship—we can't replace you. ERIS: Cross the chasm. Enter their world. Ghost: It's a dimensional lock. As long as this turbine is stationary, this place and everything in it exist in only one realm. This must be how Oryx moves between dimensions. The Guardian notices a shrine on the near side of the bridge used to cross. A Tomb Husk sits nearby. Ghost: (whispers) A tomb husk... Careful. We've still got to avoid them. The Guardian picks up the husk and, keeping a safe distance away, slips past the Ogres and activates the shrine, constructing the bridge. Ghost: Let's hope they can't see this thing. They make it across, finding even more Hive on the other side. Carefully avoiding their path, the Guardian reaches the door on the far end. It opens slowly, and with a deafening rumble. Ghost: Do you think they heard that? The Guardian, now clear of Hive for the moment, is free to run through the large barren hallway leading to Crota's home, now his tomb. A strange sound dirge fills the air. The Guardian makes the final drop into the pit below. Eris: Reach Crota's tomb and take what remains of his soul. Ghost: The symbol of Crota... I don't know the derivation or its meaning. To me it says 'we're going the wrong way', but as usual, I'm just following you! The Guardian walks out into the main area, where the final battle with Crota took place. Several Deathsingers are surrounding the area; this is the most heavily guarded room in the Hellmouth. Ghost: There are a lot of tombs here—how do we find Crota's? Eris: You'll know it when you see it. The Guardian cautiously and carefully makes their way through as the Deathsingers commence their lamenting hymn. 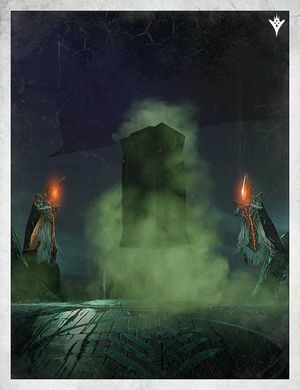 The Guardian finally makes it to Crota's tomb, and begins soaking in a green smog. The Guardian is in the worst possible situation: four Deathsingers are within touching distance, and over a dozen Hive Majors are surrounding them. Ghost: I think we found it. Eris: Now... let the crystal drink deep from Crota's death essence. As the Guardian absorbs the fog, their body starts to glow, and the essence is seen flowing into their body. Ghost: (whispers) It's working! How much do we need to pass as an Ascendant Hive? Eris: Only a taste, but steal all you can. The Guardian's glow intensifies, until suddenly the camouflage veiling the Guardian disappears altogether, leaving them visible to the entire Hive guard. The Hive retreat and the room is quickly filled with Taken. The comms systems become heavily distorted as the Guardian runs. Ghost: Something's wrong! We're exposed! Cayde: (urgently) Lock for transmat! Get out of there! Eris: (obsessively) We must have Crota's soul! Cayde: (adamantly) They've got enough!! Lock for transmat, Ghost! Ghost: I can't! Everything is corrupted!! I can't connect... stay alive! We've got to make it back! The Guardian is forced to defend themselves while the Ghost attempts to find a way out. Taken Thrall and Hobgoblins surround them, but the Guardian manages to defeat them. However, more Taken spawn in their place, now including Psions and Minotaurs. The Guardian struggles with the increased numbers, but eventually kills most of them. The next wave of Taken is wholly overwhelming; along with dozens of Taken reinforcements, two more Taken blights open to reveal Baxx and Ta'aun, the Left and Right hand of Oryx. They open fire on the Guardian, easily weakening them within inches of their lives. Eris Morn's voice comes in clear—not through the Ghost's comms, but inside the Guardian's own head—she is speaking telepathically. Eris: Guardian!! COME... WITH... ME...!! Eris quickly speaks an unknown incantation, echoing within the Guardian's head. A bright white flash obscures their vision. The Guardian finds themselves in the Oversoul Throne, completely removed from Crota's tomb and out of reach from the Taken; they are safe. A large Hive warship can be seen clearly in the sky, indicating where the Deathsingers had come from. Ghost: (amazed) You pulled us out! Eris: One of Toland's tricks... there is nothing I fear more than the Dark, but I will not lose another Guardian. You've imprisoned the last whisper of Crota's soul. It is left to you now. Find Oryx on the Dreadnaught. Destroy him. Ir Anûk and Ir Halak's Grimoire cards can only be obtained by killing them in this Story mission. This is difficult as a Swordbearer will spawn when 25% of one sister's health is depleted and will detect the player if they are not careful. With patience, time, and the right weapons (1000 Yard Stare is recommended), one can acquire both cards.